The April 2011 edition of Sign Builder Illustrated features a sign project collaboration between Signs By Benchmark and JH Signs & Designs, Inc. of Perham, Minn. Read the story below or click here to read the story online at the Sign Builder Illustrated website. The town of Hawley is a small community located in western Minnesota. This idyllic family-friendly locale boasts plenty of amenities attractive to people seeking a small town life: Good schools, friendly churches, active park and recreation programs – and a life-sized replica of a Viking ship. As they say, the usuals. A couple of years ago, the town started up an advertising campaign called “Hawley-would” (say it aloud), which promoted its allure. But officials also recently wanted to make another splash by installing a couple of “Welcome to Hawley” monument signs along the main highway into town – the thought being these signs would act as another attractive statement toward the community. Enter JH Signs & Designs, Inc. (www.jhsigns.com) of nearby Perham Minnesota. JH Signs is a full-service shop founded, owned and operated by Justin Helmke; the four-person business works on a wide variety of projects – from small vinyl decals to large illuminated signs to message centers. “There’s a lot of manufacturing and industry in the Perham area, so you have to be diversified to stay busy all year long,” says Helmke. Helmke came up with a design that says: “Hawley welcomes you!” The monument signs would be cellular plastic-structured with a simulated river rock base and a pillar. The face would host LED channel letters, as well as a dimensional version of the town’s logo. Shortly after Helmke met with the town council to present his ideas, they offered his shop the job of building and installing the welcome signs. They wanted two of them. Helmke accepted and contacted Signs By Benchmark (www.SignsByBenchmark.com) of Watertown, South Dakota, which creates exterior/interior signage, as well as sign accents. This was the first time Helmke had worked with the company, but he learned they had experience creating monuments for cities, churches, businesses, etc. The composite-core signs were made from expanded polystyrene (EPS) cellular plastic, which provides “almost unlimited design flexibility,” according to Frey. The detachable, three-dimensional logo elements and the faux stone elements were also crafted from EPS. Once all elements were assembled, Signs By Benchmark hard-coated the signs (as it does with all its other orders) with its specially formulated polyurethane to create a seamless surface that’s strong, durable, and won’t rust or rot. “The hard coat allows our signs to withstand extreme weather conditions – typically from -30°F to well over 100°F,” says Frey. Now How to Light These Beauties? Since the signs were being set up a distance away from a power utility, the question of channel letter illumination arose. According to Frey, solar power is a good alternative source of energy in remote locations where conventional power isn’t readily available. “For those who choose off-the-grid options, solar power can be a savvy, cost-saving choice for sign illumination,” he adds. Signs By Benchmark constructed the signs with a hollow core and removable rear access panel to gain access to the interior for eventual wiring management of the channel letters. During construction (and after the drawings had been approved), Helmke requested Benchmark see about the specifics for a raceway and pass-thrus for the wires. Internal raceways had to be manufactured into each sign to accept wiring for the reverse-lit solar-powered channel letters. Helmke hired wholesale sign manufacturer Pascual Signs Company of Osseo, Minnesota to produce the channel letters, at which time a file was needed for Benchmark to place the pass-thrus in exactly the right place. “All went well working with both companies passing files back,” says Helmke. 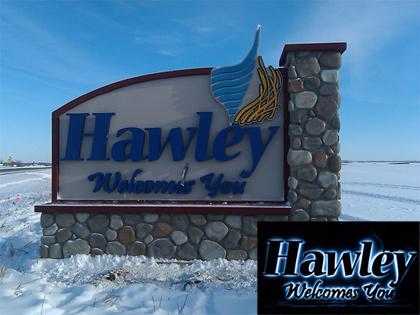 The “Hawley” letters are 26 inches high-by-24 inches wide, while the “Welcomes You” text is 13 inches high. The letters were all built individually and painted a blue color. “The signs contain an aluminum panel behind the polyurethane face to which the channel letters were stud-mounted,” explains Helmke. On each solar unit, there’s a bank of batteries that stores the energy. When the sun set and rose the first day, it set itself to pick up the light; the letters now turn on when the sun sets and shut off when it rises without having to use a timer. “The batteries are 12-volt, so they’re wired directly to the LEDs without a power supply,” says Helmke. Ensuring there was enough room to work inside the sign was key. After obtaining a template from Pascual Signs, Signs By Benchmark installed PVC sleeves into the sign body in line with the pass-thru locations in the channel letters. 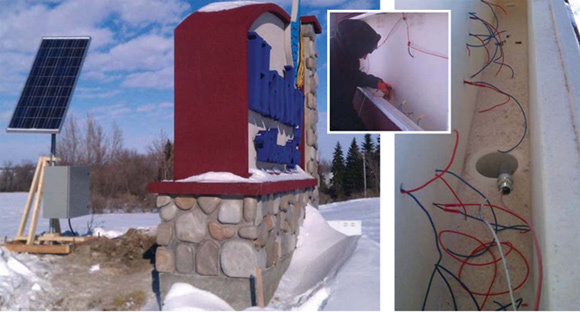 “Knowing the letters were going to be attached on-site, installing the PVC sleeves at [our facility] allowed us to completely seal the penetrations into the sign body. This was going to save time for the installer by eliminating the need to drill them on-site,” comments Frey. Each single-face sign measures thirty-eight inches deep, nearly fourteen feet wide, and a little over ten-and-a-half feet tall. Because of the size, Signs By Benchmark had to consider what would work best for shipping to the site via their drop deck shipping vans. “We built the three-dimensional, embossed city logo accents out of cellular plastic as separate pieces, so they could be bolted to the sign on-site,” says Frey. Helmke and his install crew had used a two-man auger and shovels to create five-foot-deep footings that formed two holes for the posts to go into and have a nice, flat platform to set the sign on. JH Signs installed everything manually – except for the lifting. For that, they brought in a portable crane on a trailer. “We had to lift the signs up about ten feet over the poles and slide them into place,” says Helmke. The project spanned about a two-month period, with much of this time spent during the city council’s revision-and-approval process. But all ended well with new signs that are powered at night by the sun’s daytime glow. “The town of Hawley said it’s the first time they can remember having received a call from the public to let them know they liked what they’re doing! That’s satisfying,” says Helmke.